Unlike that White Rabbit this white chocolate (and darker chocolate parts) rabbit wasn't holding a smart pocket watch, but he did have a fetching satchel with a chocolate egg just poking out of it. 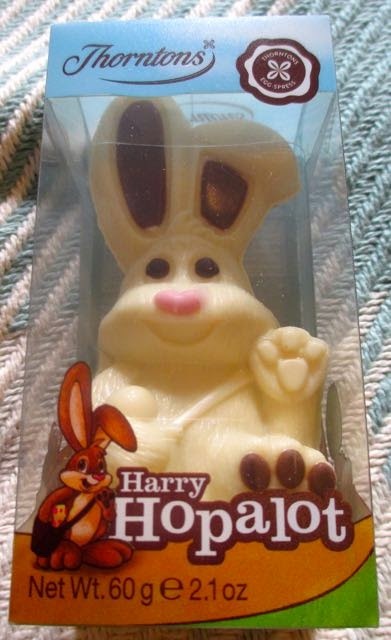 Partly because Harry Hopalot had seemingly forgotten a watch I felt that time was running out for him, and partly because I rather like white chocolate. So I nabbed Harry for a short while when Cinabar wasn't looking. You see I wanted to find out where he'd got the egg in his satchel from. He foolishly let out that he knew the Easter Bunny. I said that if he knew the Easter Bunny he must know where his secret hideout is where he keeps all his chocolate eggs. Except Harry wouldn't tell me. He appeared a tough little rabbit, and I quickly began to wonder just how much torture this cute white chocolate rabbit could take. Net weight 60g. Per 100g at 545 calories with 30g of fat and 62g of sugar. Suitable for vegetarians. Ingredients contain no artificial colours or flavours; sugar, cocoa butter, dried whole milk, cocoa mass, emulsifier; soya lecithin, milk fat, flavouring, fat reduced cocoa powder, colour; Beetroot Red. May contain nuts.